At the Romanian Skete of the Honorable Forerunner (Timios Prodromos in Greek) there is a miraculous icon of the Panagia. 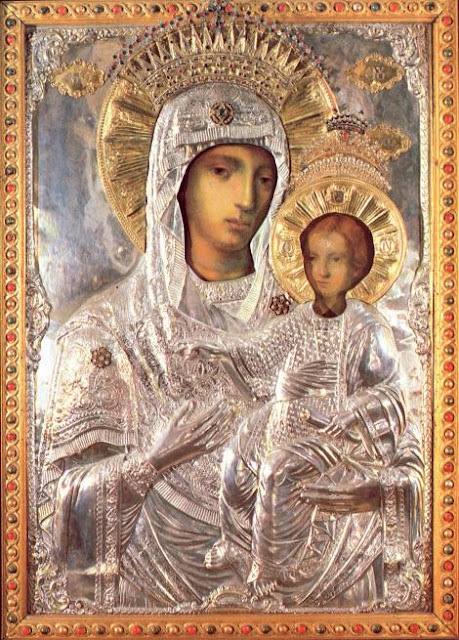 It is a rare icon of the Orthodox Church, because it was painted without human hands. This miracle of acheiropoiitos (created without hands) iconography came to be in the following manner. In the year 1863 the founders of the Skete, Fathers Niphon and Nektarios, wished to acquire a beautiful icon of the Panagia, like all the other Athonite monasteries. 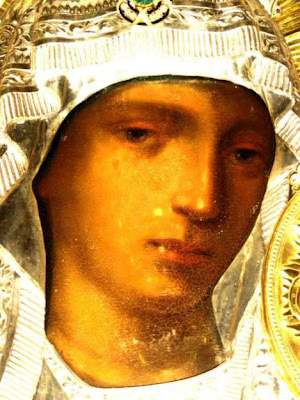 In Iasi, Romania they found a pious iconographer named Iordakin Nicholas, and they asked him to paint with prayer and fasting the icon they desired. The iconographer agreed, and with much reverence began his work. 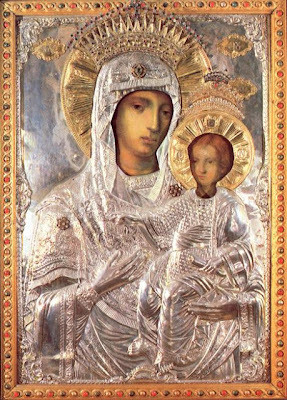 While he daily read the Supplication Service to the Most Holy Theotokos, in the beginning he painted the vestments of the Panagia and the Lord. Then he tried to paint the face, but failed. Pained and troubled he stopped the iconography, covered the icon with a cloth, locked the lab, and retired to his room to pray harder. The next day, wanting to make an effort to paint the divine faces, he entered the lab. When he withdrew the cloth which was over the icon, he beheld a wonder of the Lord. He was amazed to see that the sacred and all-holy faces were miraculously and perfectly made, and the icon was completed in its current form. 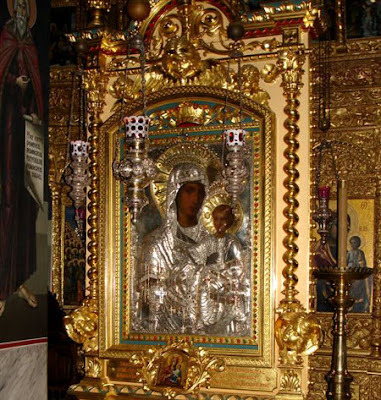 The fathers of the Romanian Skete received and transferred the wondrous icon to Mount Athos. During the journey it accomplished numerous miracles and continues to work miracles today, to the glory of our Holy Triune God and the salvation of the faithful. It is celebrated on July 12th.